You can always tell when you are getting old when you start comparing 'now' with 'then' and noticing the huge differences! When I started buying hi-fi, it was, compared to a lot of other hobbies, fairly expensive, at least to buy anything decent. 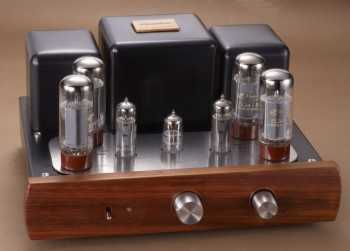 As my system changed over the years, I never really considered valves mainly because a valve amplifier was always so much more expensive than a solid state alternative. Even as the cost of hi-fi came down, it was still very unusual to see a budget valve amplifier. Well that seems to have changed these days with the Chinese producing what seems like a copy of every valve circuit ever conceived. If you look at the prices you may wonder how they ship them so far for the price. Of course, all this may seem to good to be true. For many, dealing with companies in China, or even Hong Kong, is a risk that they don't want to take. Even purchasing through Ebay raises concerns about warranties, servicing etc. Then there is the worry about reliability, safety, parts quality and so on; we've all got 'made in China' stories to tell! So for those that are attracted by the low prices, but would rather deal with a European distributor, AAAVT in Italy, supply a huge range of valve amplifiers, phono stages etc making it a much safer proposition to try these items. Obviously anything supplied by a European distributor is going to have to comply to safety regulations. And if something does go wrong, you are dealing with a European company bound by European law. So this takes a huge amount of the risk out of buying Chinese hi-fi. AAAVT kindly offered the TNT staff the pick of their product range to review. Of course it is tempting to go for something 'top-of-the-range' but I was more interested in seeing what is available for a more modest budget. Perhaps a straight alternative to a decent medium budget solid state amplifier. Having limited experience with valves, I sought the advice of one or two friends who know much more about the subject than I do, and eventually settled on the Yarland M34 as being a good candidate for this review. Selling for 485 euros (about 342 UK pounds or 708 US dollars) it is not the cheapest of the AAAVT offerings but I hoped it would offer a decent enough performance. If you really just want to try the valve sound for yourself, and you're on a very tight budget, AAAVT do valve amplifiers for as little as 230 euros! The M34 I was sent was the version using KT66 output valves. I am told that the KT66's in the M34 have been styled on the old GEC Genalux KT66 valves. I found the M34 easy on the eye with its curved wooden fascia contrasting nicely with the sturdy black metal of the chassis, and a polished top plate reflects the glow of the valves. The M34 works in class A, pushing out around 35 watts per channel, plenty enough for most speakers, and certainly for the fairly efficient speakers that I tried it with. It's an integrated amplifier with three inputs and a volume control, and an on/off switch on the front panel. The M34 arrived very well packed! A stout cardboard carton and plenty of rigid foam packaging completely protects the amplifier from any potential damage during transit. The valves are separately packed in their own box, inside the main carton. An initial inspection of the build quality and finish left me quite impressed! I find the M34 aesthetically pleasing and I certainly didn't get the feeling that I was handling anything 'cheap and cheerful'. Nothing loose, nothing flimsy, it looks and feels like it is built to last! It takes just a few minutes using the supplied instructions to install the valves. Don't worry if you have never done this before, it is foolproof. And with the valves installed, the M34 can be connected into your system. There is a choice of connections for the speakers, depending on whether they are 4 or 8 ohm loads. A power lead attaches to the M34 via the IEC socket on the rear, and power turned on using the switch on the front panel. I actually always test amplifiers to make sure there is no nasty DC that would damage the speakers and was reassured to measure absolutely nothing. I got no nasty noises when I powered up, and only a slight click when I powered down. I started off with the M34 installed in my second system. As usual, I left the M34 playing for a few days to burn it in and then started listening. Playing through my IPL A2, the sound was immediately 'appealing'. I spent much longer than I intended on that session, going through a number of CDs. Suffice to say that the M34 sounded very pleasant, and performed well enough to give me the confidence to install it in the main system. The main system is connected to the Hawthorne Duet clones rated at 6 ohms, half way between the 4 and 8 ohm outputs (taps) of the M34. I decided to use the 8 ohm taps first. The sound using the 8 ohm taps was very slightly thin (for my taste) but not so much so that I couldn't enjoy the music. The tone of the M34 is much like the Gainclones. But compared to a GC, there is more weight in the lower frequencies, sort of like a GC on steroids. Bottom end isn't the tightest I've heard but it wasn't bloated either. Top end was very good, crystal clear with metal sounding like metal. After a couple of days, I tried the 4 ohm taps and immediately noticed the difference. The sound was no longer slightly thin. In fact now it sounded slightly the other way. Could the 2 ohms either way really be enough to prevent me getting exactly the correct tone with my speakers? But I repeat, with neither setting was the sound unpleasant, and as usual much depended on the actual recording being listened to. With some speakers, the choice of 4 or 8 ohm connection may be down to personal taste! Mid-range was slightly less clear than with the Gainclones, perhaps due to that valve distortion? The noise floor was low with nice 'black' silences where they should be. Even with my effcient open-baffle drivers, I had to put my ears right next to the drivers to hear any noise from them. And all I could hear then was a low whine which quickly disappeared as I moved away from the baffles again. The 'valve sound' with that mild distortion that so many people like, was most evident with strings, particularly guitars, either acoustic or electric. Some of my favourite recordings featuring guitars sounded very enticing. On the other hand, I felt that the distortion gave vocals less clarity than I get with the Gainclones. All types of music sounded good with the M34 but it's what I call a 'fun' sound rather than being technically accurate. That said, some parts of the music did sound very lifelike. All in all, the M34 was very likeable, non-fatiguing, and there isn't much to say against it. One other thing that I noted was that the M34 seemed to sound better after playing for a while. I don't mean after it was powered up and left on, but after it had actually played some music for say 30 mins. So how would I sum up the M34? Well my first thought is to compare it with amplifiers that I remember auditioning in the past. It would certainly make a viable alternative for some of the solid state amplifiers in the same price bracket. And at the price, it would clearly have had an advantage over some other valve amplifiers. In 1981 I bought an Arcam A60 amplifier for 228 UK pounds. That is the equivalent of 672 pounds today. That makes the M34 about half the price, and if it had been an option back in 1981 at the same price, I'm sure I would have bought it instead of the A60! On the other hand, comparing it with what else is available at today's prices, makes it not such a clear choice. While I liked the M34, and found it had many virtues, I also felt that for me to give it an enthusiastic recommendation, it just needed a bit more refinement. I felt that a little bit more work (tuning) could produce real dividends with the M34. Perhaps some tube rolling, may be a couple of parts substitutions inside, or even a tweaking of the circuit. 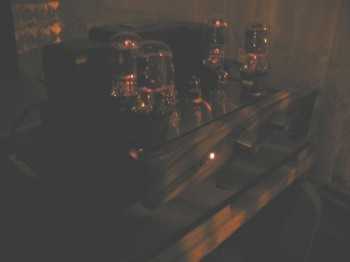 Perhaps the way to view the M34 is as a well-made valve amplifier with a good specification at an amazing price. Most valve amp owners like to roll the valves anyway, and the cost of a few 'exotic' capacitors and resistors is not a lot. So without breaking the bank you could land up with an excellent amplifier for a very fair price. So for those of you wary of giving your credit card details to an unknown supplier in the Far east, AAAVT take the risk factor out of buying some classy valve gear, and still give you a huge saving at the same time. I'm sure this is the way that hi-fi is heading and it seems to make sense if the quality of the gear matches this valve amplifier! AAAVT are very friendly and helpful, and I recommend you taking a leisurely look through their vast product list.